Is it too far too say that this may be the best makeup product decision I have ever made? Pale skin girls, this is definitely one for you. I cannot even begin to tell you how long I have been looking for a foundation/base that is actually light enough for my skin. Every product out there seems to either be too orange toned, too pink toned or simply too dark - yes, I'm talking even the palest of the shades. And I know that a lot of you fellow pale skin girls face this same goddamned problem. But I am telling you, this actually matches perfectly. We may be onto a winner here! Don't fret if you have darker skin, it also comes in two other shades, 2 and 3, so there's one for everybody. Can we also please address the fact that this is specifically made for oily and blemish prone skin? I absolutely adore tea tree oil. I keep it no secret on my blog that I have oily and spot prone skin. Putting tea tree oil on any blemishes that I may have, morning and night and is super effective (you can check out my post about using tea tree oil for blemishes here). So how could I say no to a product that is infused with the stuff? Instead of having that gross feeling that I'm slapping on a load of pore clogging, spot producing foundation on my face every morning, I actually feel like I am putting something on that is going to be beneficial for skin. I was also pleasantly surprised with the coverage it gives. Although it is an extremely light product, which makes it perfect for the summer, may I add, it does cover my blemishes and pigmentation up enough that I feel comfortable leaving the house with only it on. Of course, you can add a dash of concealer if you feel the need to, and your spots will be completely hidden. Being an oily skin girl means that powder is generally a necessity. If not, my make up will be tragically sliding down my face by lunch time. Even sooner in the summer heat. I have actually been venturing out with no powder on when I use this BB cream. It seems to be able to keep my oilyness at bay, allowing it to actually stay on my face. My skin also appears to be nice and dewy - something that before, I could only achieve by piling on a load of highlighter. 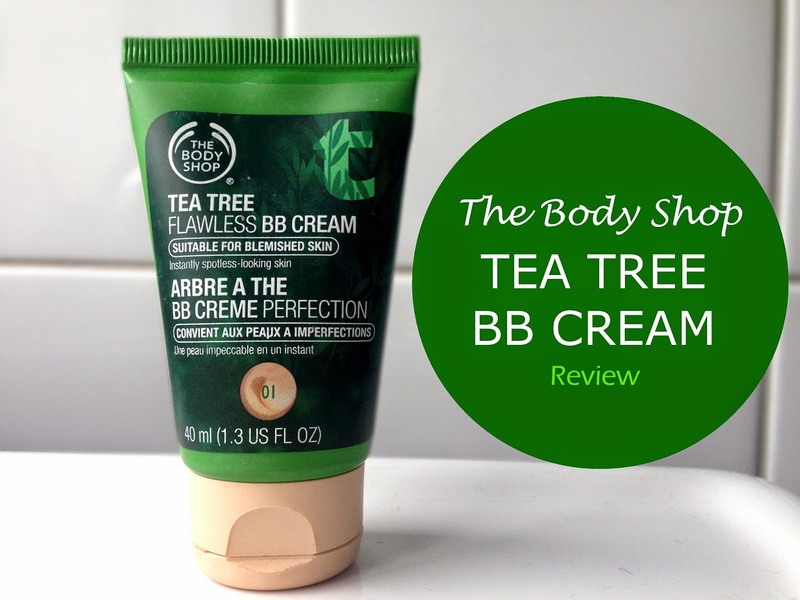 The Tea Tree BB Cream has been my savior this summer, and what a bargain for only £8! What are your thoughts to The Body Shop's newest addition to it's Tea Tree Range? I absolutely have to try this! The lightest shades hardly ever suit me so this one might just be the right foundation for me! i can't get enough of BB cream, PERIOD. so thank you for reviewing it! gotta look out for this brand. I don't have oily skin but you make this product seem like one to try! I also like to use tree tea oil for blemishes. I used to absolutely love The Body Shop tea tree oil range! I always had a little tub of tea tree to put on spots overnight. Luckily now I'm out of my teens my skin is no longer oily, but I'm still tempted to get this anyway haha! Haha I feel you on the paleness- I hate it when they give you a pink tone. How does that look good on anybody? And that's great it offers some healing power for the pimples- I'd definitely feel much better about putting product on top of them then! My skin is so pale so this'd be great for me. It's impossible trying to find products that match my skin. Alsom I love the tea tree oil range from TBS so I'd love to try this out! I just picked up the Garnier BB cream for combination/oily skin. I wish I had seen this first so I would have picked it up instead. Darn it! Nice review! Sounds like a great product! Ooh I am trying this, my T-zone area can be a right nightmare and I would use this as a base and use the Bodyshop All In One over the top. I just discovered your blog and I love your style and your posts, they're amazing. Your style is unique and I really do like that. Following you since now on! omg, I have to try it, every foundation I have ever tried has been too dark, too pink too orange.. I am really pale so its hard to find the perfect one, also I have really oily skin soo ... :) btw I have followed you feel free to follow back! Love this, i think this is a great product, i hope we have that in our country too! That color would be perfect for me in the winter! Too bad its for oily skin, mine is very very dry. Yup, the palest shade is often too dark for me as well. My skin is blemish prone, while still being very dry so I don't know if it would work for me. The coverage looks amazing for a BB cream though. ooh I totally want to try this out!! Ooh this looks fabulous! Most BB creams are way too dark so I'll have to have a look at this really soon! I like this product I wish it would come to my country. Great post. I normally don't shop at Body Shop and I'm questioning why not? I've been looking for a good BB cream and this one seems to be a great choice! I was definitely considering trying one of these, I have tried other products from the Tea Tree line, I'm going to try the BB cream for sure now! Oh my good god, thank you so much for making this post! Being a pale blemish-prone sister myself, I'm always trying to find a foundation base that's not as heavy as my usual makeup, so I must try this out! Can't wait to try this, the Tea Tree range of skincare saved my skin! Nice that they have lighter shades, I currently use the Garnier BB Cream for Oily skin and although it's really nice the 'light' shade is a touch dark! This sounds really good! My skin is combination/dry in the winter and combination/oily in the summer, so this would be a nice alternative for summer. i had no idea they made a bb cream, going to look into it asap! ooo you've really made me want to try this, being a fellow pale skin girl it sounds perfect!